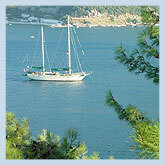 Between May and October we have gulets (6- cabin yacht) departing every Saturday from Bodrum and Marmaris. Departures are guaranteed and we can confirm even 1 passenger on these regular, weekly departures. The trip includes all meals. Contact us for further information. 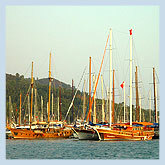 Day 06 Visit Cleopatra Bay. Lunch and overnight in Karacasogut.